Does having freedom of speech mean that street preachers are protected while preaching the gospel? You must realize that when you are bringing the gospel into the world, you’re entering enemy territory, so don’t expect a friendly reception. A person’s rights to free speech when preaching the gospel are as varied as the land itself. Most civil and state authorities prohibit the distribution of Bible tracts in school, so you may have the right to free speech, but that doesn’t allow you to go down the school hallways preaching the gospel. Section 5 of the Public Order Act 1986 makes it a criminal oﬀence in Great Britain to use “threatening, abusive or insulting words or behavior with intent to cause harassment, alarm or distress.”  The European Convention on Human Rights guarantees the freedom of expression, including freedom of speech (Article 10) but also have similar restrictions to that speech. Many of the local authorities have similar language in their local law books, so even though you have a right to preach the gospel, in most places, no one has the right to publicly condemn or label someone or some group of people with hateful slangs and insults. I don’t think any Christian should ever do such a thing in private or public. It is contrary to Jesus’ command to pray for our enemies and do good to those who do evil to us, and love those who hate us (Matt 5:44). Having rights doesn’t always mean doing right. What are your legal rights if you ever decide to share the gospel, either one on one with the public, or in street preaching to a larger crowd on a street corner? Most public street corners are where many street preachers go. He or she wants to go where the fish are. They might even bring a megaphone to reach a larger audience. When it turns bad is when you start naming certain people and associating them with certain sins. That may be true, but it can get you into trouble. Not only by angering others, but by coming across as a self-righteous hypocrite (to them). One man was threatened with arrest for publicly reading the Bible verse that says, “the cowardly, the faithless, the detestable, as for murderers, the sexually immoral, sorcerers, idolaters, and all liars, their portion will be in the lake that burns with fire and sulfur, which is the second death” (Rev 21:8). If the man had publicly read, “For the wages of sin is death, but the free gift of God is eternal life in Christ Jesus our Lord” (Rom 6:23), I think people would have still heard the gospel, without condemning them before they heard it. By the way, the Holy Spirit does the convicting. 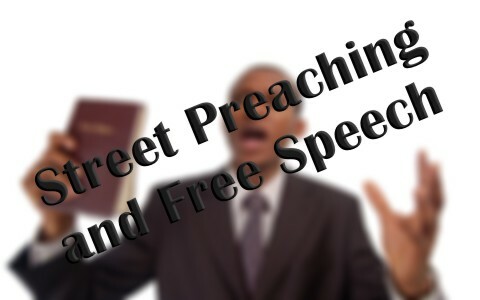 In most places, street preachers are protected by the first amendment rights to free speech, but even so, they are sometimes faced by law enforcement who may not even know the preachers legal right to publicly preach. That doesn’t mean we turn belligerent. The police are doing their duty. We are to give honor to whom honor is due and obey those who are in authority (Rom 13:1-5). Only when man’s law contradicts God’s law do we ever obey God’s over mans (Acts 5:29). You must realize that when you are bringing the gospel into the world, you’re entering enemy territory, so don’t expect a friendly reception. I have had dogs chase me, one cat brave enough to try, people slam doors in my face, people laugh me to scorn, a few swear at me, and yet, a few still hear what the gospel is all about. Even fewer will sometimes freely receive what Jesus freely gives. They have been brought to a repentant heart, they have confessed their sins, they have come to the cross for saving through Jesus, and they have trusted in the name that is most trustworthy of all! Even if you have the right to free speech and may share Jesus in public, others have the freedom of speech to heckle you or condemn or judge you. I know that is one of the most difficult things that the street preacher will face, yet they know they “will be hated by all for my name’s sake” (Mark 13:13a), and “If they persecuted me, they will also persecute you” (John 15:20). The street preacher, or any believer, that has been or is being persecuted, knows that a blessing comes with it (Matt 5:11-12). Certainly, many businesses and government and state offices restrict the freedom to publicly preach the gospel and even pass out Bible tracts. The same is true in some public and private transportation avenues like jet aircraft, trains, subways, and buses. All we can do is all we are able to do…legally while showing respect and honor to all men and women, but you can definitely expect resistance, so take heart in the fact that if you are persecuted for righteousness’ sake, and “If you are insulted for the name of Christ, you are blessed, because the Spirit of glory and of God rests upon you” (1st Pet 4:14). Now who wouldn’t want that!? Take a look at this article: What Does the Bible Say About Criticism? Resource – Scripture quotations are from The Holy Bible, English Standard Version® (ESV®), copyright © 2001 by Crossway, a publishing ministry of Good News Publishers. Used by permission. All rights reserved. [1.] Mill, John Stuart (1859). “Introductory”. On Liberty (4th ed.). London: Longman, Roberts & Green (published 1869). para. 5. [2.] The European Convention on Human Rights guarantees the right of freedom of expression (Article 10). I have been doing some research on “free speech” in America this past week. I especially have been reviewing the legal rulings regarding speech in the US and how the current laws govern which speech is legal and illegal. I am not a lawyer and am willing to stand corrected if any who are reading my words find any errors. The last major law I can find defining what is acceptable as free speech was in 1969, known as the Brandenburg vs Ohio ruling. Brandenburg was unfortunately a KKK leader and advocated terrible things in our country. He was sentenced to jail for his speech but was later released based on the court challenge overturning his sentence. Under this decision by the Supreme Court, it ruled that speech is unacceptable which was, “directed to inciting or producing imminent lawless action and is likely to incite or produce such action”. It also added the “intent” of the speaker. That is, if the speaker was talking passively about violence towards others but his intent was not to imminently cause violence, IOW, without malicious intent, it did not qualify as being illegal. Anyway, that’s the law. The reason I was reading up on this was because of the recent shutting down of speakers in our country by the radical left political party. Not allowing opposing views is becoming quite the phenomenon that is racing across our country since the election. Whether one is a Democrat or a Republican or neither should not be the basis by which we allow public discourse. Some of my best friends are atheistic liberals, myself a conservative Christian, and we have great discussions in a friendly manner about politics and religion. This new(er) phenomenon where the radical left shouts down, burns cars, breaks windows, etc., silencing through violence any opposing views is exactly what those individuals decry…fascism. They call me a fascist for being a Christian conservative while defining fascism through their actions. From Websters, “Fascism: a…movement…that stands for…severe…social regimentation, and forcible suppression of opposition.” Yet none of these “protesters” were arrested during the inauguration or at the University of Berkeley as they destroyed property and attacked any in opposition. We are losing our ability as Christians or non-Christians to voice our opinions in a public forum without intense malice and threat of violence. I am reading with increasing alarm the ideas of the far left. The leaders of these movements I have witnessed personally have voiced their views that any who would oppose their beliefs are to be shut down, wherever they are found(subways, street corners, office spaces, schools, etc.). If they cannot be removed through verbal attempts then they believe they should be removed forcibly, including with violence. I am not making this up. I have been around many years and I have not witnessed anything like this even during the Vietnam protest years. Someone might cite the Watts riots during the mid 1960’s but those folks broke the law with their violence and they knew it. These “protesters” that I mention today actually believe they have a “right” protected by the Law to silence those with opposing views through violence, stating that we are the haters…the fascists, and that we must be stopped. “…and the time is coming when those who kill you will think they are doing a holy service for God”(Jn 16:2). We are quickly devolving into a new “group think” that resembles 1984 in an alarming fashion. Thanks Doc. Yes, you are spot on about the 1984 fashion in our culture. Amazing that the home of free speech, Berkley, now explodes into protest and violence if anyone wants to speak and differs from their own point of view. The days are getting more evil bro. Come quickly Lord, as we’re see wicked spirits work in the children of disobedience and escalating violence. I am sorry but I must disagree. First of all, we either have freedom of speech, or we do not. So-called “Hate speech” labeling is a direct assault on freedom of speech! So, if someone says homosexuality is a sin, that labels the person a “homophobic, bigot” and using “hate speech”. That is called silencing dissent! Funny how calling a Christian a bigot and a ______phobe for preaching the gospel isn’t hate speech, but someone quoting scripture IS. I guess that part of the First Amendment that states that “CONGRESS shall make no law respecting an establishment of religion” means nothing as by silencing Christians it is “establishing” the religion of Humanism and that part about “or prohibiting the free exercise thereof” can just be ignored if that exercise might hurt someone’s feelings. And where does this infringement on free speech stop? I agree that Christians need to be very careful and wise in which words they choose to use, and scripture tells us this also, however, where does it stop? You can’t speak negatively about islam even if it is the truth because someone might be “offended” and label it “hate speech” which makes one subject to legal actions. And yet it is perfectly fine to curse at, insult, lie about and even physically attack Christians with impunity! Previous post: How Can The Disabled Still Serve God? Next post: How Should Christians Deal With Depression?